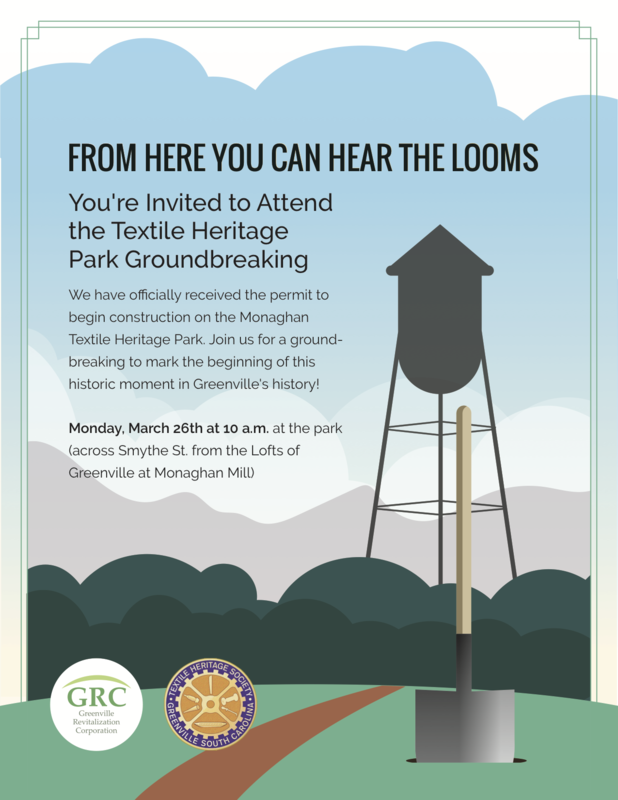 Groundbreaking at the Textile Heritage Park - Monday, March 26 at 10 a.m.
Last Chance to Buy a Brick! Last chance to buy a brick for the Greenville Textile Heritage Mill Walk! Orders end June 1. Charlotte is an attorney with South Carolina Legal Services, a state-wide, non-profit law firm that provides free legal assistance in civil cases to low income residents. Charlotte represents clients in the areas of housing, employment, family, and immigration law. She was previously in private practice. Charlotte has been a board member of the Greenville County Redevelopment Authority since 2012 and is currently vice-chair. Charlotte is a graduate of Ohio State University and the Washington College of Law at American University. Steven Bryant is the owner of the Chick-fil-A franchise at Cherrydale Point in Greenville. He graduated from Furman University in 1992 with a Bachelor of Science in Physics, then earned a B.S. in Electrical Engineering from Clemson in 1994. After completing his academic studies, Steven held various engineering positions for ExxonMobil, including managing a multi-disciplinary team to operate a lubricants basestocks plant at the Baytown (TX) Refinery. Steven’s Cherrydale franchise employs approximately 80 full and part time associates, and is regarded as one of the most successful franchises in the Carolinas. A graduate of the Leadership Greenville Class 33, Steven also serves as the Chairman of the Business Owner’s Committee for the Poinsett Corridor Project. Sean P. Hartness is actively involved in real estate development in Greenville and Charleston, S.C. Mr. Hartness earned a B.A. in History in 1992 from the University of South Carolina. He is an active pilot and aviation enthusiast. After a 20+ year career in packaging with Hartness International, he founded Hartness Development in Greenville and was part of the leadership team that established King and Society, a full-service real estate firm in Charleston. Since making this career move, he led efforts to develop the Homestead at Hartness, a 140-homes for lease innovative development in Greenville. Currently, he is a board member of Furman University, Board of Visitors; Airplane Owners and Pilots Association (AOPA), the Greenville County Museum of Art and Triple Tree Aerodrome. He is a past board member of the Peace Center for Performing Arts, and the Community Foundation of Greenville, Inc. He is active with the Society of International Business Fellows and attends First Baptist Greenville. He and his wife, Dr. Courtney Tollison Hartness, enjoy traveling and watching historical documentaries. David Doser is Vice President of Engineering and Business Development at Jennings-Dill, a Greenville-based mechanical contractor founded in 1947. He was formerly a Principal Associate with the architectural and engineering firm Clark Patterson Lee. David has served on the board for the Greenville County Redevelopment Authority since 2009, and is a past board chairman. He also serves on the board of the Rotary Club of the Foothills. David is a graduate of Union College in Schenectady, NY. Entrepreneur Joe Erwin is the co-founder and former President of marketing agency Erwin Penland, as well as co-founder of the Erwin Center for Brand Communications at Clemson University. In 2016, he founded Erwin Creates and its innovative centerpiece – a collaborative co-working community for creative services professionals called Endeavor, located in the heart of downtown Greenville. A graduate of Clemson University, Joe began his career at Greenville’s Leslie Advertising, and joined DMB&B in New York before returning to Greenville in 1986. He and his wife Gretchen opened Erwin Penland with one account and two employees. The agency experienced extraordinary growth during his 29-year tenure as president, ultimately employing more than 400 team members in Greenville and New York. The agency’s national client roster grew to include Verizon Wireless, Denny’s, L.L.Bean, Michelin’s Uniroyal Tire brand, Chick-fil-A and Disney XD. Active in the community and the advertising industry, Joe has served on numerous boards and commissions, including the South Carolina Special Olympics, the Governor’s Commission on Teacher Quality, the Partnership for a Drug-Free America, the American Association of Advertising Agencies and Clemson University. Amy Dunn-Coleman is a graduate of Furman University, and worked for almost 10 years at Greenville Communities and Schools, Inc. Subsequently, she worked at Raymond James and Furman University. Amy is currently an officer at ARC Accounting. She has served as a volunteer at different Greenville County schools and coached soccer for the Caine Halter YMCA. Amy serves on the Greenville County Redevelopment Authority board. She previously served as the chairman of the GCRA operations committee. Kelley Hendrix Hice is a native of Greenville, SC and is currently the Chief Financial Officer of Hitec Chemicals, Inc., a chemical manufacturer in Travelers Rest. Kelley and her husband Carey C. Hice Jr. own the business, which was founded in 1981. Wil Brasington is the Director of Alumni Relations for Clemson University, overseeing all aspects of the Clemson Alumni Association, and representing the institution on matters pertaining to its 125,000 graduates. Additionally, Will manages the affairs of the organization’s governing board, the Alumni Association Board of Directors. He holds a Bachelor’s degree from Clemson and a Master’s in Business Administration from the Darla Moore School of Business at the University of South Carolina. Will has lived in Greenville, SC for over a dozen years, and he places a high level of importance on community service and civic involvement. He previously served as vice chair of the Greenville County Redevelopment Authority, and is on the board of the Ronald McDonald House of the Carolinas. Additionally, he serves as the chair of Leadership Greenville and the President of the Alta Vista Neighborhood Association. Doug Dent was a practicing attorney for 42 years representing a variety of business, non-profit and individual clients. For that entire period he represented the Greenville County Redevelopment Authority. In 2015, he closed his practice and became General Counsel for GCRA. One of the tasks he worked on was the creation of the Greenville Revitalization Corporation, where he now serves as its CEO. As CEO, he has presided over the Corporation’s initial projects: the revitalization and leasing of the former Woodside Mill Office Building for a YouthBuild program with Goodwill, the construction of the Greenville Textile Heritage Park in the Monaghan Mill Community and the obtaining of a Market Study for the Poinsett Highway Corridor which is being used as a blueprint for the Corridor’s revitalization. Over the years he has been an active member of the Greenville Community and the Upstate, serving in numerous capacities. Some of them include: President of the Greenville Urban League; Chairman of the Board, South Carolina School for the Deaf and Blind in Spartanburg; Vice Chairman of the Greenville Red Cross; South Carolina Chairman of the Cystic Fibrosis Foundation; and a member of the Governor’s Children’s Cabinet under Gov. Richard Riley. For his service he has been honored with the Order of the Palmetto; the Human Advancement Award from SHARE; and the Robert Jefferson Wilson III, Fair Housing Award from the Greenville County Human Relations Commission; and the Douglas F. Dent Volunteer of the Year Award was established in his name at the SC School for the Deaf and Blind.